"Whilst not revolutionary, it is a taut, well-acted knuckle grinder that presents a situation without a slanted frame of mind." Crafting a timely film about current world issues that doesn’t get bogged down in opinionated politics is no laughing matter. Granted, there are many films with a lot on their minds which the crew wants to express and certainly achieve greatness with their message, but to present the audience with an accessible scenario and not sway them to a certain perspective is truly impressive art. 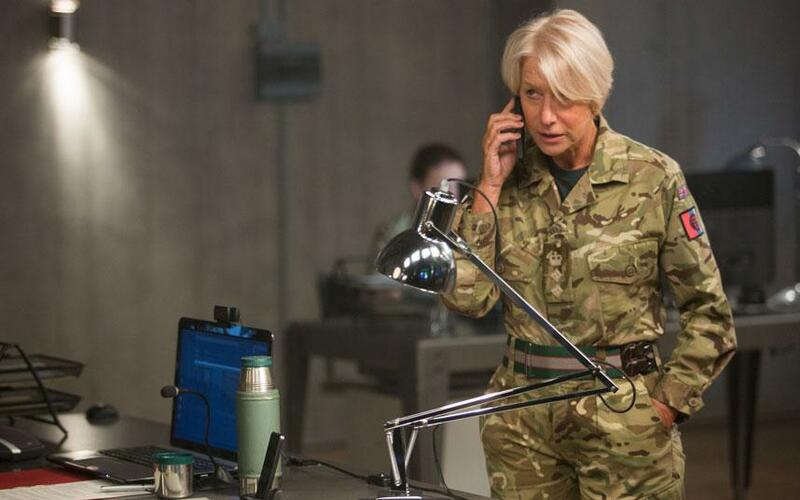 Director Gavin Hood and screenwriter Guy Hibbert have crafted a powerful example of how to do just that with Eye in the Sky, which serves as an intricate tale of warfare morality whilst racking up white knuckle tension in the process. The film centres on a drone warfare mission in Kenya, where military personnel are presented with legal and ethical dilemmas when determining whether to carry out a strike against a group preparing a suicide attack somewhere in the city. Key players are a military intelligence officer (Helen Mirren), a USAF drone pilot (Aaron Paul), a lieutenant general (the late Alan Rickman) and an undercover Kenyan agent (Barkhad Abdi), amongst others. There is little else needed to know going into the film, as once the background to the extremist group being targeted is explained, the film sits the politics on the side bench and gets down to the tough morality principles that each player faces within the scenario. It works on the morality level because it doesn’t steer towards just one perspective or method: the film allows every party ample screen time and attention to fully enrich their stance and to paint the bigger picture of every minor detail and clause that must be considered. Encased within this one mission are dozens of little details and principles that the individual players are considering, and they give many views on how to proceed. As a result, progression to an amicable solution proves painfully slow, which is why the tension escalates quickly and tightly during the crux moments. On an emotional level, for an audience member going into this not knowing details about the specifics of war crimes and legal assaults, the film will be the most powerful because you don’t know for sure what should happen. At one point, you may be thinking along the same lines as the drone pilot for holding off the strike, but then cutting back to the intelligence officer who is so keen to press forward and stop the terrorists who are about to commit unspeakable crimes and have your direction completely overturned. And when each new problem comes to light and the film embraces it so professionally, the morally correct choice feels even more ambiguous and you simply have to brace and await to see what choice is made. Unsurprisingly, Helen Mirren is terrific as the the lead of the film. A woman of steel on a mission to crack down on a group she’s been after for years, and is willing to extend legal morality to the breaking point to see the mission through. It’s also a delight to see that Aaron Paul finally gets utilised to his full strength in a post-Breaking Bad role – previously, he hasn’t been given great work to shine through after the TV show’s success. His character’s unwavering sympathetic approach to the mission spiritually personifies Jesse Pinkman’s actions in Bad. Finally well cast, Paul soaks up the role with irreverence. 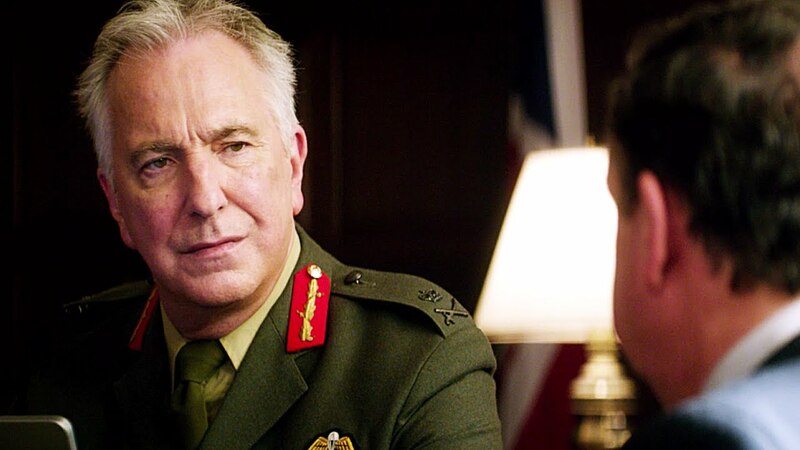 As a final live action performance, Eye in the Sky is also a brilliant send off for the late and great Alan Rickman, whose character is torn down the line between the steel of the intelligence officer and the moral dilemmas raised by his political associates. Rickman always had a knack for the act of ‘less is more’ – speaking simple and short sentences, but his commanding delivery packs a punch. While his career has been colourful and versatile, this role brings Rickman back to a solid template; but for Rickman, even a mere template lets him truly shine, and that shine will be missed from cinema. Paul Hepker and Mark Kilian’s score carries a minimalist tone of slow beats and gradual build ups to explosions of drums in rare moments, which is a perfect accompaniment to the cinematic tension. It doesn’t get in the way of the drama, just deeply playing out in the background to enforce the dilemmas. Eye in the Sky will tie up knots of tension and present a number of talking points long after the credits have finished rolling. It sets up the situation and then exports all external issues, and keeps the focus right in the heart of the military operation and the growing strains of its clashing ideologies. The ending will stick for some time, and will put the rest of the film into clear perspective over the complications and sacrifices of warfare. Whilst not revolutionary, it is a taut, well-acted knuckle grinder that presents a situation without a slanted frame of mind.